After asking him about Ignaz Friedman, whom he heard and knew somewhat, my burning curiosity was if he could recall Debussy’s one visit and concert with Molnar’s quartet on 1 December 1910 in Budapest. They played Debussy’s String Quartet and Rose Féart, who had taken the role of Melisande the previous year in London, sang the Fêtes galantes and Pensées lyrics with the composer at the piano. Debussy played his Children’s Corner Suite and pieces from his Images and Estampes: Pagodes, Hommages à Rameau, and Jardins sous la pluie. Molnar told of numerous rehearsals for Bartók’s String Quartet No. 1 which they premiered, saying that by the end they knew the work from memory. Putting Debussy and the classics aside he motioned me over to a bookshelf. Having no idea what awaited me, I turned off the cassette recorder and followed him to a shelf of red hardbound volumes. Eyeing a few, he reached out for one, flipped to a page and began singing a folk song he had collected before World War I, as he was then accompanying Bartók and Kodaly on their field work and was moved to share this treasure he encountered in a remote village in what is now Romania. A few days ago while researching Debussy’s trip to Budapest, translations of Molnar’s published comments were contained in a tasty article by Gergely Fazekas entitled “Unhealthy” and “Ugly” Music or a ‘Compass Pointing towards a Purer Art of Superior Quality’? published in 2008. To put it mildly, Molnar was not thrilled with Debussy’s music, as his close relationships to Kodaly and Bartók had a greater impact on his understanding of new musical directions. I have to divide Debussy’s faults into two groups if I want to be fair with him. The first group will contain the features I personally didn’t like; the second will contain the undeniable faults.
. . . to cut my particular criticism short, I just hate it when sturdy, vigorous Frenchmen play at being irritable, oversensitive creatures with a world view that wraps a mystically flickering universe in a pink veil. Incompetence often resorts to pompous sophistication to make up for a lack of wholesome ideas. No wonder Molnar was eager to move over to the folk song anthologies! Four months after this visit, Molnar was gone. 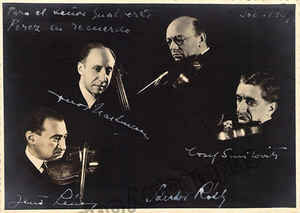 While the Waldbauer-Kerpely were never recorded, the first evidence of how a Hungarian string quartet approached Debussy’s masterpiece comes through the Lener Quartet, captured in London on 15 March 1928. 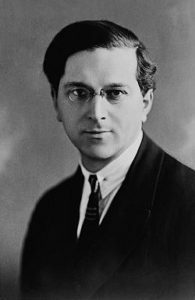 Their first violinist Jeno Lener was born in 1894 and may have attended the Debussy event but certainly the older group’s members were teaching and available to advise the Leners. Great stuff! Love the “more purple” instruction. Every conservatory string quartet who attempts the Debussy probably requires similar coaching as that received by the Waldbauer-Kerpely in this section!